A young swordsman named Rune is strolling in the woods when he notices a lake. And bathing in the lake is the most beautiful girl he has ever seen. Suddenly, a wolf leaps from the woods and attacks the girl. Rune swiftly defeats the beast. The girl he saved turned out to be Cecil, the princess of Barran! Watching how the princess was taken back to the castle by a zealous knight, Rune swears that he will do anything to become worthy of her love. And his friends (all of whom happen to be girls) have no choice but to help him! Last Crusader is an RPG with several distinguishing features. The player controls a large party of six people. There are no random battles: enemies can be seen walking around. Once the player character and the enemy have contact, the player is taken to a separate battle screen. The turn-based battles have a strategy element: it is possible to move characters on the battlefield, and attack physically when enemies are close. There is a variety of healing, supporting, and offensive magical spells in the game. Characters belong to different classes (warrior, priest, etc. ), and have access to different abilities. Probably the most unusual (for a Japanese RPG) feature of the game is the player-controlled leveling up. 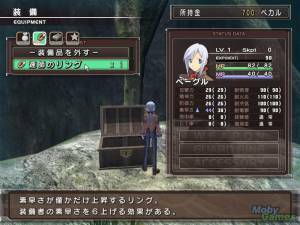 Experience points do not turn into better character parameters automatically, but have to be allocated by the player, increasing attributes such as HP, strength, stamina, magic power, etc.